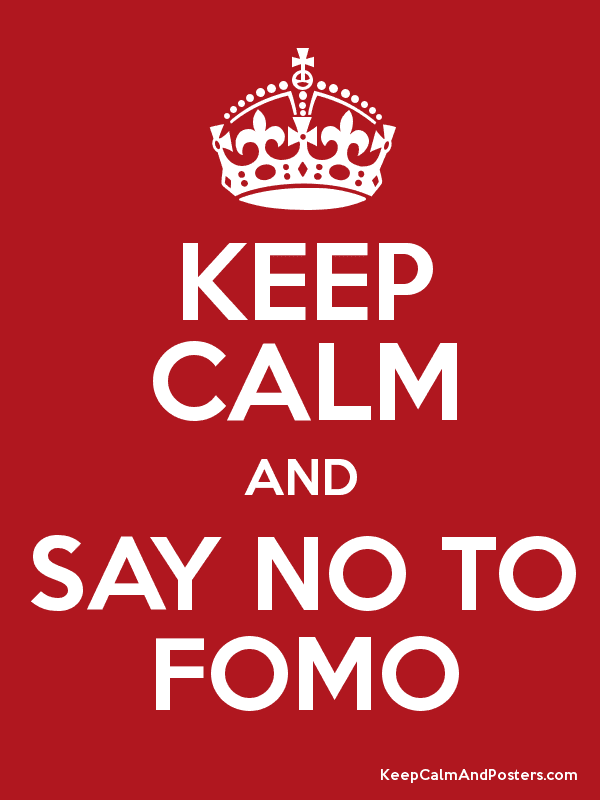 FOMO: The disease that's sweeping the nation! Fear Of Missing Out, or FOMO, as it's known among millennials, is the phenomenon of always feeling like you are missing out on an important social event, even if you are already attending one. This phenomenon stems from our generation's constant access to social media that reminds us that many people are doing way cooler things than you all the time. Even marketing campaigns have latched on! I've heard that some people have never been afflicted by this tragic disease; unfortunately, I have always been one to fall prey to its clutches. Even before social media - ever since forever! - I've wanted to be in the middle of the action. I have been known to triple or quadruple book myself in one night, racing around town to attend happy hours, writing groups, birthday parties, dance classes, ETC. Hey, I guess you could call me an extrovert? It's mildly possible. 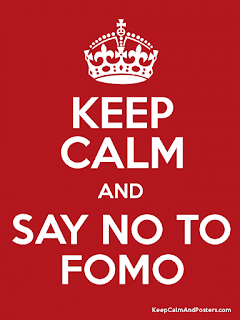 Since starting graduate school, I have noticed my terrible case of FOMO wane. First of all, I am no longer living in Miami, a city where I know too many people and have too many hobbies. Besides a few literary events and some salsa socials once in a while, there is not much going on in my world here in Tampa. Second of all, school kind of takes everything out of you. Not having internet at my house also helps. With these factors combined, I am well on my way to a life of writerly hermitude! But I think the change has been even more important than all that. It hasn't been a fight against FOMO so much as it has been a redirecting of its energy. Rather than fearing what I am missing in the outside world, I find myself fearing what I am missing out on at my writing desk. The more I get connected to my writing projects, the harder it is to abandon them for some party or happy hour. Anyone who has tried their hand at writing can tell you that writing takes time. So, so, so much time. And so, I have become protective of the little time that I have. Rather than going to every social event that comes along, I pick and choose more carefully now.